Wanted! People who would like to Grow Japanese Maples at Home. You are here: Home / Uncategorized / Wanted! People who would like to Grow Japanese Maples at Home. You can do this. This is a fun and interesting home based business that requires very little space. The demand for Japanese maples of all kinds is huge and it is growing by leaps and bounds. But there’s a problem. Most Japanese maples are really, really expensive! And the rare, more interesting vaieties are really hard to find. Especially in the local areas. Because of that I’ve started my own nursery that specializes in Japanese maples. However, at this time I really only intend to sell mine on a local basis. That’s great for the people who live close to me. But what about the rest of the country? The people who live near you would jump at the chance to buy Japanese maples from you if they could! Since 1999 I have been teaching people all over the world how to start their own backyard nurseries and we have incredible success stories. People selling thousands and thousands of dollars worth of plants right from their own backyard. But guess what they never have enough of? The very first thing that they sell out of are Japanese maples. People go crazy over Japanese maples and when you over them at a reasonable price people go crazy and buy them on the spot! Here’s another secret. There are a lot of people out there that are absolutely fanatical about Japanese maples and they will keep coming back and buying more and more and more. Every variety that they can find, they buy! I know. I’m one of those people. That’s why I got into the business. To support my habit! Now I’m the proud owner of thousands and thousands of Japanese maples and I am absolutely in love with them. Is that crazy? Maybe, but I’ll sell some of them eventually. How much room do you need to grow and sell Japanese maples? In your mind, picture a picnic table. That’s how small of an area you can work with if that’s all you have. A picnic table is approximately 4′ wide by 8′ long. In an area that size you can fit approximately 128, #1 containers. Most nurseries sell Japanese maples in #5, #7, or even as large as #35 containers. The prices usually start at $75 and go up to $350 or more per plant. And they have no problem getting those prices, but at the same, time those prices keep most people out of the market. Many people just cannot pay those kinds of prices for a Japanese maple so they are forced to do without. So what we as Backyard Growers do, we offer the general public smaller, but really nice plants for a lot less money and they love us for what we do. Often times we sell small Japanese Red Maples for as low as $4.97. But we also offer larger, or more expensive varieties for more money. We can get up to $39.95 or maybe $49.95 for a Japanese maple in one gallon container. Japanese maples are a hot item and when people see them they just have to have them. I mean they have to have them! And that’s why I love this business so much. You don’t have to twist anybody’s arm to sell them what you have. They come to you, cash in hand, hoping that you still have some plants left to sell them. Then they come back and buy more as long as your prices are reasonable. And that’s the secret to this. You and I, we are giving the general public an opportunity to buy one of the most beautiful plants known to man, at prices they can’t even imagine. How long does it take to grow a Japanese Maple? That depends. Growing Japanese maples is a process, but I speed up the process greatly because I buy small Japanese maples on the wholesale market at deeply discounted prices and grow them on from there. And to be perfectly honest with you, I could take those plants right out of the box and sell them on the spot the day that I receive them. But I don’t because by growing them on for another year, two or three I can get a lot more money for them. Me? I’ll probably sell most of mine for $90 or more. I have some lower priced ones that I might sell for as low as $4.97. I only paid $1.35 for those so even at that price I’m making great money. But those who come to buy the $4.97 Japanese Red Maples are likely to fall in love with my more expensive plants. I’ll tell you a story about a guy named Andy. Andy is a customer of mine. He bought my Backyard Growing System. Andy found a source for all kinds of really rare Japanese maples and offered them for sale on this private site that I’ll tell you about later. I watched and followed along as Andy took orders for these Japanese maples. Actually, I was doing the math. Andy had two prices. $11 and $13. After about a week Andy excited posted that he had sold over 1,000 plants. In a week! So I congratulated him on selling $11,000 worth of plants in a week. During the winter! And he was dumbfounded. He was so busy taking orders it didn’t sink in that he took in $11,000 in a week until I pointed it out to him. That winter I only bought about 20 plants from Andy so this little Japanese maple garden. I said that Andy was my customer right? Well guess what? Now I am Andy’s customer! In the past two years I have purchased over $6,000 worth of Japanese maples from Andy because his prices are great and his plants are really rare, and really nice. I mean really nice. Lots of our members buy from Andy and those plants are some of the first plants they sell out of. They never seem to buy enough. Good question. Most Japanese maples do well in zones 5 through 8 which covers a large part of the United States. If you are zone 4 or below (brrrrrrrrrr) you might be able to do this, but I would consider it risky. If you are zone 9 or warmer, I think the sun is too bright and the heat too instense for raising Japanese maples. Check your zone here. Of course you can create protected environments with shade or even with a greenhouse, but I don’t do any of that. I buy small plants and grow them in full sun here in Ohio. And we do get some really hot days during July and August. And of course our winters can be pretty brutal as well. How many different ways are there to make money with Japanese maples? Ahhhh! Allow me to count the ways. 1. Seeds. You can make money collecting and selling Japanese maple seeds. There are always people looking for fresh Japanese maple seeds. You can probably get the seeds free from a tree or several trees in your neighborhood. I have several trees in this area that do not belong to me, but I have permission to collect seeds from those trees. 2. Seedlings. There’s a huge market for Japanese maple seedlings. Japanese maples are easy to grow from seed and other growers like me are always looking for seedlings they can buy. Seedlings with green leaves are usually sold to people who want to graft onto those seedlings. Seedlings with good red color can be sold just about anywhere. I just ordered 2,000 Japanese Red maple seedlings. Some I got for $1.06 some I paid $1.35 for. Think about that. $1.35 for something that you grew from seed and you can sell hundreds at at time to one customer! And get this. I put those seedlings with deep red color in the field and in a few years I can easily get $50 each for them! By then they are usually about 42″ tall. 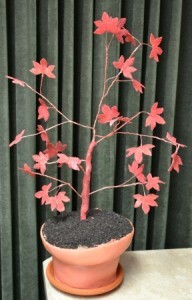 Japanese maples with deep red colored leaves usually produce seedlings with good red color. They won’t all be red, but many will and even the green ones fetch a good price because the grafters need them. I’ll tell you how you can easily find buyers for your seedlings. 3. Small grafted Japanese maples are super hot sellers! That’s right, if you want to try your hand at grafting (it’s easier than you think) you can grow the really rare varieties that people like me and other growers buy. Growers like me buy hundreds of grafted Japanese maples at a time. I already told you that in the past two years I’ve purchased over $6,000 worth of grafted trees from Andy. But I also buy from at least one other source and spend thousands and thousands of dollars with them as well. I’ve got a customer who bought my Backyard Growing System several years ago. She admitted that she had never grown anything before, but since I was offering a money back guarantee she took a chance. Jen has done incredible well! She is now an expert at grafting Japanese maples and when she came to visit she brought this rare Japanese maple as a gift for my wife Pam. Today Jen specialize in growing and grafting Japanese maples and sells to the wholesale market. 4. You can make money buying and re-selling Japanese maples. That’s what Andy does. He buys them wholesale and actually re-sells them wholesale. I’ve got a lot of sources where you can buy Japanese maples wholesale, but I will also show you how to find other wholesale suppliers that I don’t even know about. I know where they are, but I haven’t had the time to track them down. But I’ll show you how to do that. There might be one close to you, depending upon where you live. We’ve got another member that found a guy that had a surplus of a really popular Japanese maple and he bought and re-sold a ton of them. I’m still kicking myself for nodding off on that deal! He was selling them for about $3.40 if I remember correctly. I’m waiting for him to make that offer again. The only reason I didn’t buy right away when he offered them last year is because I had hundreds and hunreds of Japanese maples that I had just bought and I wasn’t sure that I’d have room for them. When I finally tried to buy 100 of them he was already sold out. Dang! 5. You can do like I do. I buy small Japanese maples and grow them on to sell for $90 or more. Landscapers love to use Japanese maples in their designs and they are more than willing to pay $150 to $350 for a nice trees. Landscaping is very, very expensive and people that are willing to spend $20,000 or more on a landscape want the best plants on the market. They also want plants that their neighbors don’t have. That’s why I plan to sell my Japanese maples at a larger size and mostly to the wholesale market. For right now just think about what I said about starting out in an area about the size of a picnic table. You can grow your home business to any size you want, but it’s easier to just think about a business about the size of picnic table. There’s another advantage to starting out with an area about the size of a picnic table. With a little tiny nursery that size you can consider it a hobby and depending upon where you live that might be to your advantage. Anytime you start a home based business you have to think about any restrictions that might apply to neighborhood, such as zoning or home owner association restrictions. If you keep it small your neighbors won’t even pay any attention to what you are doing. You never mention how one can get involved in this, or your growing system. I’m looking for something to supplement our income, as I am disabled, and my husband is retired. Please contact me with further information. I am in Jefferson, TX., and have the land to grow on. maybe i’m just not finding it… i too can not find the info on where to get the japanese maples. i have looked on every page that is given to get this information. i have watched the video, bought the handbook, tried the website you gave above ( it didn’t give the info by the way, just a page to buy the handbook i already bought), scoured everywhere i could find in your information… but nothing, nowhere, sends me to the information on buying these japanese maples! thanks for all the information you have given on gardening. being retired and disabled, i believe this is one way for me to stay fairly active and make a bit of extra income. thanks again. Like everything else in life, buying Japanese maples wholesale isn’t super easy. You can go to a site like Mr Maple.com but they have rare Japanese maples at retail prices. The supplier that I buy from requires a minimum order of $500 which most people are not prepared to make. Typically from them I pay about $1.50 each Japanese red maple seedlings. In our members area http://backyardgrowers.com/join there are a few members that offer Japanese maples at true wholesale prices and you can buy just a few. But even within our group, they are only available a couple of times a year. We do have some other wholesale sources that are listed in the University or you can ask in the members area, but we don’t publish these on the web because they are true wholesale sources. I wish it were easier, but it’s just not. Where do we get seedlings?? Hello linda how are you.? My name is Truitt i am 29 years old and love nature. I especially love japanese maples and other rare beautiful trees and plants. I am very intrested in growing japanese maples on my land as a business decision to sell them. I live in Ellerslie Georgia, just about 10 miles North of Columbus Georgia. I have about 200 acres that has been in my family for generations. We have mostly grown hay to sell and feed our cows. But i think you have some great ideas and id love to converse witg you and bounce some ideas back and forth. Im very interested in going into business with you. Visit http://mikesbackyardnursery.com/ and get on the list there you’ll see how to get started. My dear friend Mike I just read all your story on Internet about Japanese maples and I’m very exciting about it, I’m actually try to do that for last few years but because was some other business evolved, I didn’t have enough time to get myself on it completely. With today’s economy I had to leave my business but i still have a farm, which used to be Alpaca farm, which also gone because the economy. Now I decide to get back to Japanese maple idea and I have right now maybe around thousand plans and I planted some seeds. I live in central jersey and I have a farm about eight and half acres with the building 35 x 75 which can be used as greenhouse, i want to thank you for sharing all this information, which can be used very successfully,feel free replying if you have any better idea for me, thank you again Mike. I receive many emails from you about selling Maple trees, but I checked my growing zone and we are in zone 9. Isn’t zone 9 too hot and dry for Red maple trees? I would really like my trees to have a red color but will zone 9 be good for that? I don’t think that I could sell trees that are not true to color!!! Please advise my request for Zone 9 information. Verna, there are a couple of Japanese Maples for the warmer zones, but not that many. my own business as well!! my new job that i start Tuesday. of you and your family!! Trish, there are lots of different ways to sell Japanese maples and other plants from home. You can dig them bare root when they are dormant and ship them to customers. A lot of my Backyard Growers do that, or you can pot them and sell them that way. Or if you grow them larger they can be field dug and sold. Do you have any recommendations for what size plastic pots or from where to get them? I am in central Maryland near Baltimore and i think my zone is 7a. Saying that, i would like to know the right time to hand pick seeds off of a japanese maple tree. I have a very strong habit for Japanese Maples. I grow them from seeds, rooted grafts, #1 potted plants. I have about 35 different types ranging from 15-20 foot trees down to 12 inch dwarf trees, love them all. I also have a small Bonsai collection. I think that anyone that has a source for seeds or cuttings should follow through and get growing. I live in Snohomish, Washington so the growing conditions are great. I have a mature (13 years) Japanese Maple that has just grown way to large for the space it is in. I live in north central MD. Do you happen to know anyone interested in a maple this size? If the tree is really, really nice a local landscaper might be interested. You have inspired me to try this plus i love japanese maples. I have 20 acres of property in southern illinois. Would you recommend me planting them in pots and placing in ground for easy removal because i dont have equipment to remove from ground once planted. I would like to get started growing Japanese Maples. What is a good wholesale source for them? Any you are aware of in Oregon or elsewhere? I would like to start growing seedlings in a greenhouse. Please advise. I grow Blood good here in MD. I have trouble finding buyers for the larger mature trees. Any help? Bloodgood is a great variety. You really need to test drive our members area, http://backyardgrowers.com/join, when it’s open. The members area is all about selling what you grow. Where can I buy 1000 Japanese Maple seedlings and at what cost? Hi we have a beautiful 15-20 foot Japanese Maple at our home in Georgia that we’re open to selling to anyone interested. Do you have any recommendations for how we can sell this? Thanks! Craigslist? Can’t be dug now until Thanksgiving.